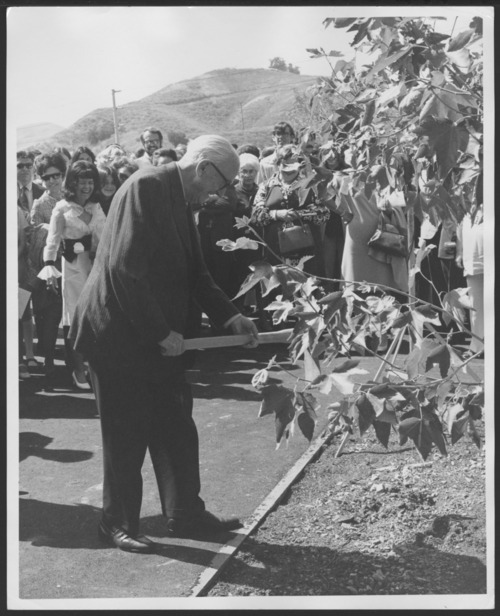 This photograph shows Dr. Karl planting a tree on Arbor Day. Dr. C.F. Menninger and his sons, Dr. Karl and Dr. Will, founded the Menninger Clinic for mental-health treatment, education, research, and prevention in Topeka. Arbor Day was always celebrated at the Menninger Clinic because of the deep interest in the environment.